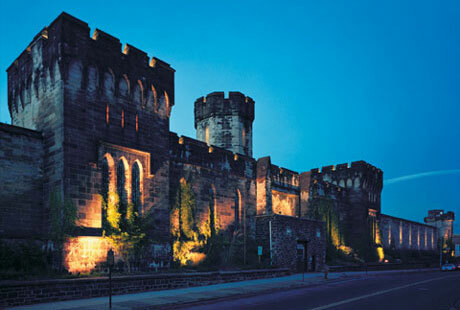 Behind The Thrills | There’s A Party At Eastern State Penitentiary TONIGHT! There’s A Party At Eastern State Penitentiary TONIGHT! There’s A Party At Eastern State Penitentiary TONIGHT! Tonight, the Eastern State Penitentiary in Philadelphia, PA, is hosting a very unique Special Event called “Dance Party at the Pen; A Masquerade“. This is the second year in a row the creators of the popular Terror Behind The Walls have hosted the party, but never before have they hosted any event with such a huge lineup of entertainment! The party starts at 9:00pm tonight, May 18. 2013. DJ Scopitone will kick off the dance party by spinning speakeasy-style records on antique phonographs right outside the jail cell of the infamous Al Capone! Later, DJ Venomous Knockout will take the crowd through a musical time travel leading up to today’s hottest hits. Headlining this year’s masquerade will be the amazing performance by ArcheDream for Humankind, an international black light performing arts group. Eastern State Penitentiary is a crumbling 10-acre property with over 1,000 rooms within its 30-foot walls. There will certainly be surprises waiting for attendees behind the iron gates. If a beautiful masked woman approaches you and invites you to follow her down a dark corridor, we highly encourage you to do so. You might just find a hidden shot bar in a cell, a secret black jack game in an old inmate workshop, or a platter of cupcakes in the prison’s long-abandoned Operating Room. The possibilities are limitless. Below is a secret message from Mr. E at Eastern State that some of the guests have received. This evening, we dance. We drink. We explore. We masquerade. Allow me to introduce myself. My name is Mr. E, and I will be your host for this evening’s Dance Party at the Pen: A Masquerade. I am so pleased that you will be joining me. In anticipation of your visit, I have prepared a list of valuable tips. If you purchased a general admission ticket, please arrive promptly at 9 pm. If you included a flashlight tour with your purchase, please arrive by 8:30 pm. It is imperative that you arrive in a timely manner. You wouldn’t, after all, want to miss anything…. Your ticket is required for entry. Please be prepared to show either a printed or digital version. Each ticket will scan only once. Any person with a duplicate ticket will be denied entry. Allow me to recommend Uber, “everyone’s private driver.” Through this service, you can order a town car right from your personal phone via smart phone app or SMS service within minutes. I’m proud to announce that Eastern State Penitentiary has partnered with Uber to provide all first-time users a FREE ride (up to $20) the night of the event. Sign up with promotional code ESPRIDEINSTYLE. Cocktail attire is recommended, and be sure to wear a mask. This is, as you know, a masquerade. Comfortable footwear is strongly encouraged. Penitentiary surfaces are not always ideal, and you never know where your adventures will take you. All attendees must be 21 or older. No smoking is permitted anywhere within the penitentiary complex. Eastern State Penitentiary is a National Historic Landmark and is in a state of semi-ruin. Please take extra precaution not to damage or alter the appearance of the site in any way. Potentially dangerous objects, including weapons of any kind, pepper spray, pocket knives, etc. are not permitted inside the penitentiary complex. The security team checks bags for potentially dangerous objects and conducts random pat-downs. Be sure to follow @easternstate on twitter. Throughout the event, I will offer clues that may enhance your experience. And if any one of my comrades offers you a hand, I strongly urge you to take it. For more information visit Eastern state’s official website here.